Its organized by the American Go Honor Society and sponsored by the Ing Goe Foundation for members of the American Go Asociation (AGA) under 20 years old. 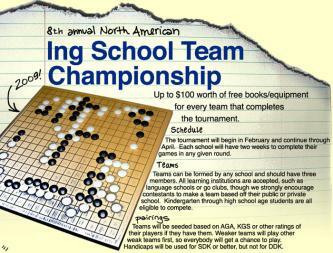 They offer go books and equipment for prizes and promise lots of fun on the board, as KGS says "A team competition similar to the ones in Hikaru no Go!" A very good idea to promote Go among young people and around the world.